My name is Zsuzsa Sugàr. Sailing is my passion and my calling. Sugàr means shine or ray in Hungarian. Let’s Sail and Shine together. This site is mostly dedicated to week-long chartered sailing in Croatia from June until October. Every week features a special theme to raise our awareness. You can choose between the different Themes for Your Mindful Sailing Tour or Create Your Own Retreat. Besides sailing summertime in Croatia, I am also available year-round as a charter skipper, race captain / crew, and delivery captain / crew. I hold the following captain licenses; RYA Yachtmaster Ocean, Croatian Boat Skipper Category C, and Hungarian Service Purpose Skipper. 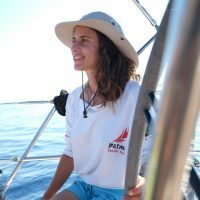 I have sailed over 40,000 nautical miles (including six times across the Atlantic), and have been sailing practically since birth. If you have your license and wish to sail by yourself, you can also book a bareboat. Let me know what you are looking for, and I will help you find your perfect boat. For simplicity’s sake, this website is only in English. My aim is to facilitate a more conscious sailing experience, and ultimately a more conscious life. Sailing is freedom with a genuine connection to nature. Hoist the sails as a bird spreads its wings and glide through the water to explore new horizons. Enjoy the open space and master the rules of the seas. Follow the natural rhythm and relax in a sheltered harbour for the night. Shine from your heart. Listen to, trust, and follow your inner voice. Let the love and joy shine through. We are here to learn from each other and enrich each other’s lives. Every situation and person you encounter bears a message for you; it is up to you to understand by opening your mind and heart. One Love: To live in an awakened world of Unity and unconditional Love.